The market for mastering limiters is crowded, but PSP's new plug–in claims to offer higher levels of naturalness and transparency. PSP are best known for the various 'analogue flavours' offered by products like the Vintage Warmer multi–band compressor, MasterQ parametric EQ, and MixPack suite. However, more recently they have focused their expertise on transparency, with the release of the MasterComp compressor and Neon linear–phase EQs, and developer Hubert Pietrzykowski has spent almost three years refining the design of the new Xenon mastering limiter to this end. Originally announced at NAMM 2005, Xenon runs at up to a 192kHz sample rate with a 64–bit internal signal path, is available in Audio Units format for Mac, plus VST and RTAS formats for both Mac and PC platforms, and requires an iLok dongle (not supplied). 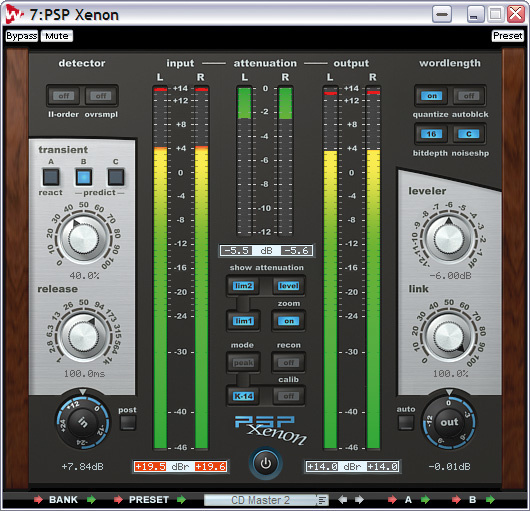 Conventional limiting can be particularly noticeable on transients, so Xenon employs a two–stage process: the first stage applies initial gain reduction but lets the transients through to the second stage, where they are treated separately using lookahead processing and envelope detectors. This gives the user far more control over how the transients sound, using the main Transient knob to control the attack time (and hence how much of the transients get through to the second stage), along with a choice of three modes. Mode A hard–clips the transients for those who want an extra edge in their music, but I suspect the majority of users will choose the B or C prediction modes, which smoothly catch transients and limit them in a more transparent way (C has longer lookahead and attack/release times, so gain reduction starts sooner and then recovers more slowly). The second stage also includes a 'leveler' control that applies a slowly changing gain reduction on louder passages before limiting is applied: great if you need to make each part of a song as loud as possible without distortion. If, however, you want to retain the original dynamics, just turn this control up to maximum for the more traditional limiting of short peaks without clipping. 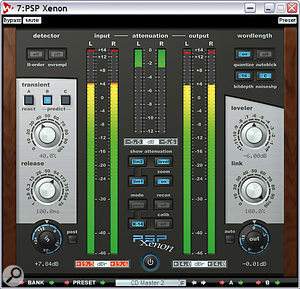 If you're after maximum loudness without distortion, Xenon has several neat tricks up its sleeve: the Link knob lets you smoothly vary the stereo linking on the first stage from 100 percent (gain reduction identical in both channels) all the way down to zero (totally independent channels, for louder overall output at the expense of the stereo imaging). Transients are always totally independent, because their short attack/release times don't affect stereo imaging. There's also an oversampling option so you don't have to pull output ceiling level below 0dBFS to catch possible intersample peaks. If your final format is 16–bit/44.1kHz Red Book CD audio or 8–bit game audio, bit–depth reduction is on offer, along with three flavours of noise–shaped dither. Peak input and output levels, as well as gain reduction, are shown on large digital meters, but you can also switch to Bob Katz's K–System loudness metering, in K12, K14 and K20 scales, with a pink-noise generator to help calibrate your monitor levels appropriately. If you don't use the oversampling option, a reconstructed metering option uses oversampling to help you avoid intersample converter distortion manually. To test out PSP's claims of extra loudness with ultimate transparency, I performed some blind tests against a selection of other mastering limiters, comprising Izotope's Ozone 3 Loudness Maximiser module, Voxengo's Elephant 2, Waves' L2 and L3 Ultramaximisers, and Wave Arts' FinalPlug 5. All were adjusted to provide around 6dB of peak limiting. All plug–ins provided good results across a range of audition material, but there were definitely differences between them. I was intrigued to find that even on first listen I picked out Xenon as providing greater clarity and front–back depth than any of the others, although with drums it gave slightly less 'clout' until I increased the Transient setting to 100 percent to let more of their attack through. I then tried some bass–heavy material to see how loud I could get it without obvious distortion or level pumping, and found that L3 was in the lead by just 1dB (not surprising, considering the multi–band limiting going on behind the interface), closely followed by Xenon and Elephant. However, I noticed some constriction in the L3 stereo image, so Xenon still came out of this test well. Many musicians only need to use a mastering limiter on an occasional basis, so ease of use may also be an important consideration. As you might expect, Waves' multi–band L3 offered the most versatile results, courtesy of its nine 'profiles', although you do need some experience to choose the most appropriate one — on my test material, some proved slightly harsh at the top end or resulted in subtle audible pumping. I was also impressed by the open and natural sound of Elephant 2, but its eight subtly different modes and associated controls do take some practice to get best results, while Ozone's Loudness Maximiser also provides various Mode and Character settings to suit different programme material. The most straightforward competitors to Xenon in my selection were definitely WaveArts' FinalPlug and Waves' L2, although several times during my blind tests I noted the top end of L2 being slightly 'veiled'. However, despite Xenon's apparently complex interface, I was surprised by how easy it was to use, generally only requiring tweaks to the Transient and Release controls. These were, in turn, made easier by Xenon's Auto output mode switch, which alters output level in real time to match that of the input (even while altering the amount of limiting). You can thus perform quick A/B comparisons between original and limited audio using the Bypass button, to hear any compromise in dynamics as you make your music louder. This is a very useful feature that's unique to Xenon. I loved Xenon's acoustic transparency, its ability to preserve delicate transients and its ease of use, which should make it appeal particularly to those involved in mastering classical, jazz, folk and other acoustic material. However, it should also find favour with those in search of the last dB of volume for music with a weightier bottom end, who nevertheless don't want to compromise on quality. Highly recommended! Retains transients better than many competing products. Auto output mode make it easy to compare input/output signals while tweaking the controls. Easy to use despite a complex–looking interface. Offers K–system loudness metering with integral pink-noise generator. PSP now use dongle–based copy protection. PSP's Xenon is one of the most transparent–sounding mastering limiter plug–ins on the market, even when you're pushing levels as hot as you dare, making it an ideal choice for anyone who wants to make their music louder with the least compromise.